2. What is an organic compound? 3. Which is the hardest form of carbon and its softest - what is the difference? 1. Diamond. (Info about picture). Only carbon builds up this crystal. Each carbon atom binds to four other carbon atoms in a completely regular three-dimensional structure. Diamond is the hardest of all known minerals. Application: jewelry, as abrasives in drill cores. Formation: Formed under high pressure and temperature in the Earth's mantle quite deep into the earth. 2. Graphite. (Info about picture). Each carbon atom binds to three other carbon atoms in a hexagonal pattern. Each corner consists of a carbon atom. This pattern is spread as sheets and these sheets form layers. Weak bonds keep these sheets together. This means that graphite is one of the softer minerals on earth. Application: in pencils - the blacking is scraped off as layers that stick to the paper. Graphite conducts electricity poorly and is therefore used in electrical circuits as resistors. Graphite can burn and thus be used as fuel. Formation: Graphite forms when plant parts and dead animals decompose in the absence of oxygen. This often happens while the material is packed together under sediment loads of eroded rock. 3. 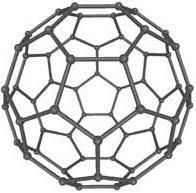 Fullerene. (Info about picture). Each carbon atom binds to three other carbon atoms in patterns of hexagonal and pentagonal rings. In each corner is a carbon atom. These hexagonal and pentagonal structures build up forms that look like footballs and small tubes. Application: Scientists are investigating the possibility to produce screens made of nanotubes. The screen is expected to be thinner than a sheet of paper. An organic compound is a chemical compound containing the element carbon, e.g. methane, chlorophyll or B-vitamin. Which is the hardest form of carbon and its softest - what is the difference? The "hardest" form of carbon is diamond. It is very durable because each carbon atom binds to four other carbon atoms in a three-dimensional symmetrical network. The softest form of carbon is graphite. It is soft since the carbon atoms are positioned in layers that can easily blacken off. Weak bonds hold together the layers. All lines between the atoms below are symbols of covalent bonds. A covalent bond includes two electrons. Below are displayed structural formulas for alkanes. Of course the series continues and even more carbon atoms can be connected in series. All compounds included in the methane series are called alkanes. Note that all alkanes end with ane. The more carbon atoms there are in a row, the heavier they are. The breakpoint between the gaseous and liquid alkanes at room temperature (25 °C) is between butane and pentane. Alkanes with 17 carbon atoms or more are solid in room temperature. Of course, the double bond instead can exist between two other of the carbon atoms in the chain. Note that a carbon atom only can bind with four covalent bonds. A double bond keeps more energy than a conventional single bond. When double bond compounds burn they release more energy compared to hydrocarbons having only single bonds. The above alkenes burn releasing higher temperatures compared to alkanes. A triple bond keeps even more energy compared to a double bond. Ethyne gas (acetylene gas) burns with a temperature of more than 3000 oC. This makes the gas appropriate to use when welding, when it is needed a high temperature. Acetylene gas is stored in gas tubes. The gas is released with a controlled flow rate and the gas can thus be ignited. The flame is blue, intense and extremely hot. An alcohol is an alkane that has replaced a bonded hydrogen atom with an OH group. All alcohol names end with ol. These compounds are then called alcohols. Methanol is very toxic. Even when having drunk a small amount of fluid one becomes blind, and at a slightly higher dose one dies. If one has been exposed to methanol poisoning one should drink ethanol and also larger doses of bicarbonate. Detoxification occurs at the doctor. Methanol has at times been confused with ethanol, which is part of beer, wine and liquor. Available as an intoxicant in beer, wine and liquor. Ethanol is a poison. A carboxylic acid is an alkane that has replaced a bound hydrogen atom and forming a COOH group. All acids with this COOH group are called carboxylic acids. Methanoic acid is revealed when terrorizing ants in an anthill. If thereafter closing in with your nose, you can feel a pungent odor. If you have a wound on your hand and holding it close to the anthill, you can also feel the wound stinging. An ant bite also reveals in the bite the sting of formic acid. Formic acid is used as a preservative for silage. Silage is grass and hay stored in large silos on farms. In order for the beneficial lactic acid bacteria to take over in these silos, it is added a certain amount of formic acid. These silos can then store grass and hay for the winter and the cows and horses can have good food even then. Ethanoic acid can be used as a preservative for cucumber and as part in window cleaner. A covalent bond is also called electron-pair bond. A covalent bond is a way for e.g. a carbon atom to lend an electron to another atom, and a way for the other atom to share its electron. This way both atoms experience they have an extra electron. Covalent bonds are used so that the joining atoms may have their outermost shell resemble the outermost shell of the noble gases, i.e. the atoms get noble gas structure. Hydrogen then has two electrons in its outermost shell resembling the helium atom (He). The carbon atom then has eight electrons in its outermost shell resembling the other noble gases. The noble gases are placed to the far right in the periodic system. Both hydrogen atoms experience they have two electrons. If you follow from hydrogen in the periodic table and further to the right, you can see that the last atom in the period is helium. Helium has two electrons in its outermost shell. The outermost shell of a carbon atom wants to have eight electrons. From the start, it has four of them, but if the carbon atom binds to four hydrogen atoms, it will have eight electrons in its outermost shell. The carbon atom then gets noble gas structure and resembles Neon. Follow in the periodic system from carbon and out to the right. Here you find the element Neon (Ne). Similarly, the hydrogen atoms also get noble gas structure. They experience they have two electrons each. The atoms become more stable when they have an outer shell that looks like a noble gas outermost shell. Hydrogen gas is so stable that it can be found in the atmosphere, although much of the hydrogen gas content in our atmosphere has disappeared into space, since the gas is so light. Also methane gas is stable and can be found in our atmosphere. Methane is 25 times more aggressive as a greenhouse gas compared to carbon dioxide that is more associated as a greenhouse gas. Greenhouse gases contribute to global warming. 1. Draw the structural formula of methane, ethane, and hexane? 2. Where is the boundary between the gaseous and liquid hydrocarbons? 3. Where is the boundary between liquid and solid hydrocarbons? 4. Write the chemical symbol for ethane and octane? 5. 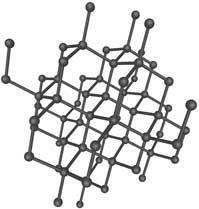 Give a joint property of all alkenes? 6. Give a property that is the same for all alkenes? 7. Give a joint property of all alkynes? 8. Give a property common for all hydrocarbons having a double or triple bond? 9. Write the chemical symbols for ethyne and propene? 10. What is required by a molecule to be called alcohol? 11. One of the alcohols is sometimes strangely mixed up with ethanol - which one? 12. What should one do if a person has been poisoned by methanol? 13. Write the chemical name for propanol and hexanol? 14. What is the same for all carboxylic acids? 15. Draw the structural formula for octanoic acid and propanoic acid? 16. What is a covalent bond? 17. Show how a covalent bond works in an ethylene molecule? 18. What happens if you mix an organic acid with an alcohol? 19. Why does it not remain so much hydrogen in the atmosphere although the hydrogen molecule is quite stable?